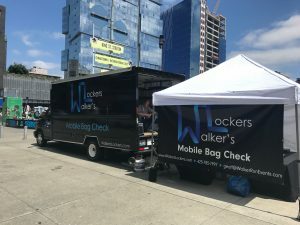 Walker’s Lockers will be present at the Microsoft Build 2018 Developer Conference to make it easy for attendees to securely check their items and enjoy the conference worry-free. We carry Liability and Bailee’s insurance to protect your property while it is in our possession. Bags and items of nearly all shapes and sizes are accepted. From jackets, pocket knives to suitcases, and anything in between, we will do everything we can to accommodate your needs. You will find our truck at the north side of the MoPOP plaza. Look for the Blue, Black, and White Walker’s Lockers truck, banners, and logos. Our service opens at 6:30pm and closes at 11:00pm.